For a small town, Ludington packs a big punch of culture – from juried art fairs, to jazz brunches, to historic exhibits. Tune into the cultural side of this Lake Michigan getaway for an enriching experience! Ludington’s vibrant live music scene explodes in the summer when local musicians take to outdoor venues. BYOS (bring your own seating), grab your cooler and head to these free, family-friendly outdoor concerts at Waterfront Park overlooking the Ludington harbor, starting with the annual West Shore Bank Rhythm & Dunes, featuring Hollywood U2 July 28 bringing the look and sound of U2, and Young Guns Aug. 4, a tribute band singing songs from country artists of yesterday and today. New this summer is Jazz Brunch in the Park, an outdoor concert series featuring local jazz artists the last Sunday in July and August from 11 a.m. to 2 p.m., weather permitting. Acts include the Brad Fritcher Quartet (July 29), and Third Coast Gypsy Jazz and the Ludington High School Jazz Band (Aug. 26). 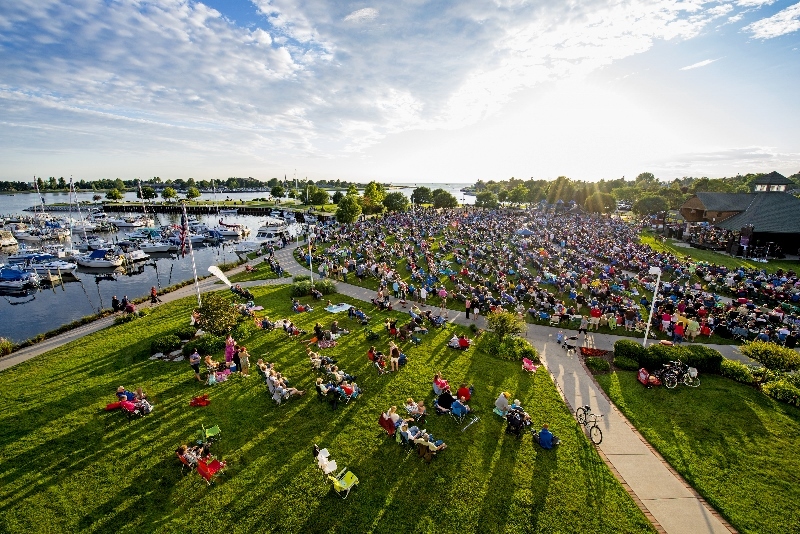 Another scenic concert spot is Ludington State Park, hosting free* concerts at its amphitheater Wednesdays and Saturdays, 7 to 8:30 p.m. through August. Performances include Awesome Distraction (covers with contemporary twist) July 11, Chris Vallillo (Midwest blues) July 14, Lee Murdock (Great Lakes folk) at the Lake Michigan Beach House July 25, Eric Engblade (Americana/folk-rock/newgrass) Aug. 1, Jim Key (dulcimer) Aug. 4, Mike Lenich with the Road Less Traveled (country/folk/strings) Aug. 8, Canopy Space (singer-songwriters) Aug. 11, Hicks with Picks (bluegrass) Aug. 15, Mike Lenich Aug. 18 and Salt City Dixie Jazz Band Aug. 25. For a truly unique music experience next to one of Michigan’s oldest continuously working lighthouses, hop a bus to Big Sable Point Lighthouse in Ludington State Park during “Bus Days” July 12 and 28, Aug. 9 and 25, and Sept. 22 to forego the two-mile one-way hike (runs every 30 minutes from 12 to 5 p.m.). Live music is featured each Bus Day. (Adult bus tickets are $5; children 12 and under are $2.). Check Facebook for the musician lineup. *A state Recreation Passport is required for entry. Want to pick up a piece of art to remember your stay? We can help with that. 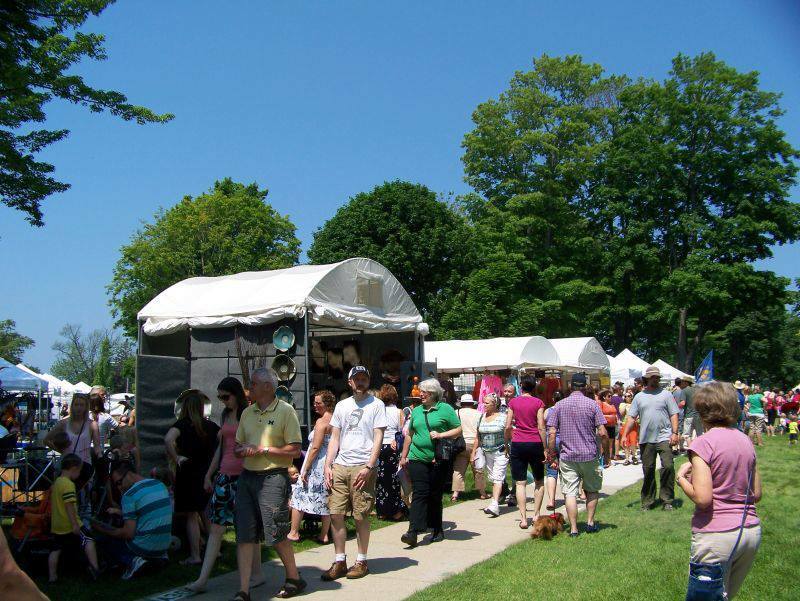 If you missed the renowned juried West Shore Art Fair, which just celebrated its 50th year July 7-8, art fair goers still have a chance to shop at the 35th annual Gold Coast Artisan Fair Aug. 11-12 in Rotary Park, featuring more than 200 arts and crafts displays. Want to browse permanent, outdoor art? Check out Ludington’s community murals gracing downtown buildings, and pose for a photo opp in front of favorites, like the giant blue Love Ludington mural on Robert Avenue between Ludington Avenue and Loomis Street. Or tour Waterfront Sculpture Park on Ludington's harbor, home to nine bronze sculptures throughout the walkable 5.3-acre park depicting the story of Ludington's rich history. For an experiential dose of culture, head to Historic White Pine Village, where history comes to life through 30 historic buildings filled with artifacts and archives depicting Mason County’s history, accompanied by docents in period clothing. Check out exhibits like the original 1849 Mason County Courthouse (on the National Register of Historic Places), Sawmill Shed with working 1905 Port Huron Sawmill (demonstrations take place regularly), and White Pine Chapel. Dedicated and open to the public July 14 on Mason County Day, is the Mason & Oceana Railroad locomotive exhibit. This is a retired steam locomotive built in 1924 that was refurbished, renamed the Mason & Oceana Railroad, and displayed in a permanent exhibit replicating the Mason & Oceana Railroad that operated from 1886 to 1909. 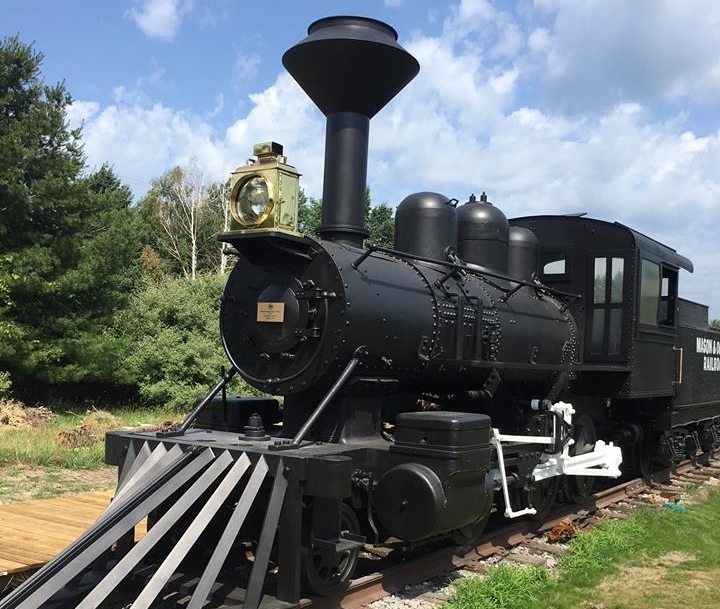 Featuring an engine, flat car and tender car, the locomotive was repainted to its original black color and is displayed on 100 feet of railroad tracks. Experience a bygone pastime and watch the Ludington Mariners, Ludington’s “old time baseball” team named after the minor league team that played in 1912-14 and 1920-1922, and again in 1926 as the Ludington Tars. Wearing replica vintage uniforms, the Mariners play by 1860 rules. Watch an old time base ball game against teams from around Michigan at Historic White Pine Village July 14, 10:30 a.m. to 4 p.m. in conjunction with Mason County Day (Mason County residents get in free; non-residents get a 50-percent discount) or Aug. 18 at 1 p.m. Learn more about Ludington’s art, culture and history scene here. Check calendar listings for cultural events at the Ludington Area CVB, as well as websites of individual cultural institutions, such as Historic White Pine Village, Ludington State Park and Sable Points Lighthouse Keepers Association.